You can't wait until a monetary system collapses to protect your wealth. Just ask the Greeks. One day they were free to access all their savings at banks, and the next day the banks' doors were closed. Depositors' only relief was a dispensation allowing depositors to withdraw up to 60 euros a day. You may be tempted to think that such a situation is unlikely to occur in Europe's advanced economies like France, Great Britain and Germany.But another severe economic downturn could bring historic bank failures. Why? Because the banking system never fully recovered from the 2007-2009 financial crisis. When Ralph Nelson Elliott discovered the Wave Principle nearly 70 years ago, he explained how social (or crowd) behavior trends and reverses in recognizable patterns. You can learn to identify these patterns as they unfold in the financial markets, and use them to help anticipate where prices will go next. Elliott Wave International has developed a free comprehensive online course -- The Elliott Wave Tutorial: 10 Lessons on the Wave Principle -- which describes these patterns and explains how they relate to one another. To use the Wave Principle as you analyze the markets, you need a basic understanding of the Elliott method -- the rules and guidelines, the literal shape of individual waves, even when the larger trend may turn. To get you started, we've included an excerpt from the free Elliott Wave Tutorial, adapted from Elliott Wave Principle by Frost and Prechter, and a short video clip from the live presentation, Tips from a Pro. "Don't cross this line or else." Impressively, an entire hour passed without incident when my friend spied the younger son teasingly edging his elbow toward the very outskirts of the noodle, baiting his luck. Anticipating the ensuing reversal of our event-free driving experience, my friend pre-emptively pulled over to the side of the road, when in -- 3-2-1! -- a small arm crossed the line and a giant tantrum ensued. 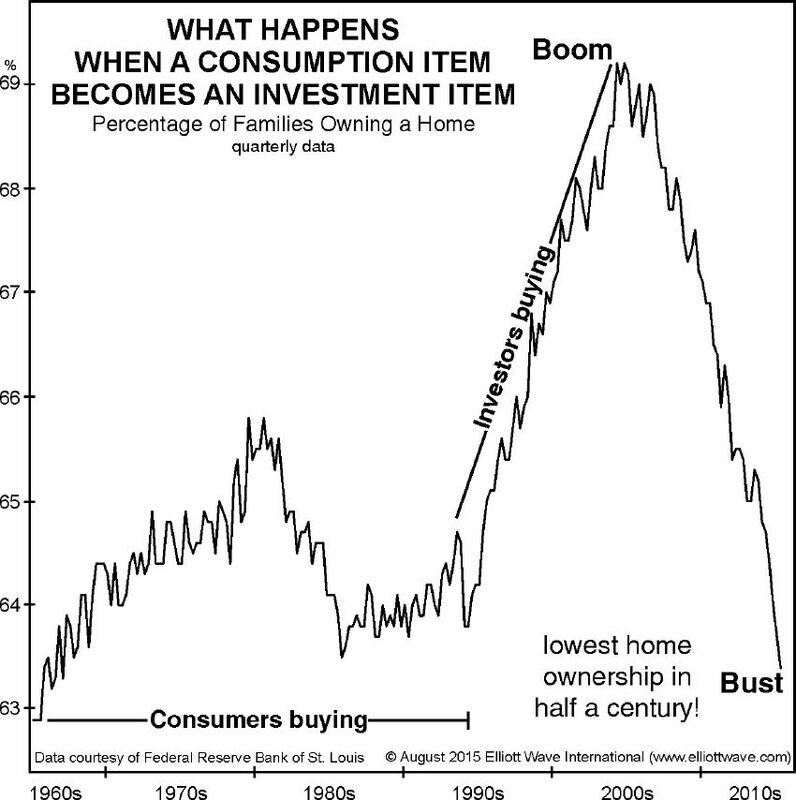 The U.S. housing market may be about to implode -- again. Before I get into the "why," know that the residential real estate market never fully recovered. The percentage of Americans who own a home is still plummeting despite the partial recovery in real estate prices. Today, the percentage of families owning homes in America has plunged to its lowest level in 48 years, nearly half a century. ... By saddling home-buyers with massive debts, the government has done the opposite of what it promised; it has ruined the American Dream for tens of millions of families. Now it's doing the same thing to education ... .